31 January 2002. Thanks to L.
Radar is a well known tool of war, an aid to aviation, and  often to our chagrin  a method of traffic law enforcement. 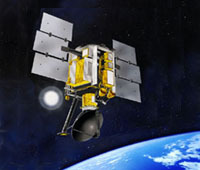 Placed in orbit, radar technology is also an increasingly important technique for monitoring the Earths climate. Radar instruments are able to penetrate clouds and see phenomena which are unobservable to conventional satellite-based cameras. A particularly versatile type of Earth-sensing radar is the scatterometer. In recent years scatterometer missions have been developed and flown by JPL primarily to measure to map global wind speed and direction. These data have proven useful in improving the forecast of extreme wind events, such as hurricanes, as well as monitoring longer term climatic effects, such as El Niño. In addition to winds, researchers have found the scatterometer measurements are a sensitive indicator of other environmental processes. These new applications for scatterometry include the monitoring of the polar ice sheet, the detection of deforestation in the Amazon, and prediction of destructive flooding events.